A massive forest fire, which started on Saturday in Tamil Nadu’s Theni, has claimed nine lives so far and seriously injured another 11 of the 36 trekkers that had gone mountain trekking in Kurangani hills in Bodi foothills. Tamil Nadu Chief Minister Edappadi K Palaniswami on Monday ordered a probe into the incident. Speaking of stepped up rescue operations, Defence Minister Nirmala Sitharaman said an advanced light helicopter had been sent to save those trapped in the forest fire. 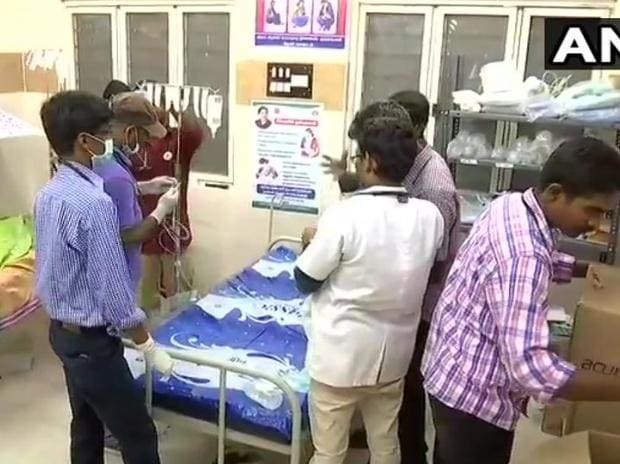 Twenty-seven people have been rescued so far by the fire and forest departments, along with Indian Air Force’s (IAF’s) aid — 11 of them is admitted to hospitals in Madurai and Erode after suffering serious burns. The defence ministry swung into full force by fielding 16 commandos of the Garud Commando Force and four choppers from the Indian Air Force to fasten the rescue operation of those stuck in Kurangani forest fire in Theni district. Earlier during the day, 16 commandos of the Garud Commando Force and four choppers from the IAF, with one of them at standby, arrived at Theni today morning to commence the search and rescue operation. “At the moment, the report is that the garuds are trying to lift the bodies of the dead to a higher plain, from where you can have the helicopters go and carry them down. So there are two helicopters waiting to do this particular activity,” Sitharaman said. One helicopter has spent a lot of time from early dawn to contain the fire. It has also has doused the fire in that area, from where the garuds have moved the bodies, she added. District Collector Pallavi Baldev said the operations were continuing and the trekkers were being brought down by the rescue team members. 2. Nine trekkers dead: The reserved forest fire in the Western Ghats near Bodinayakanur in Theni, about 40 kilometres from Tamil Nadu claimed nine lives and injured another 27 out of the 32 people that had gone for a mountain expedition on Saturday. Among the dead, six were from Chennai and three from Erode. They were camped in an estate and were returning when the fire broke out in the forest. “Nine persons are dead, while 17 of the rescued have been hospitalised and 10 did not require hospitalisation,” Commissioner of Revenue Administration K Sathyagopal said, according to news agency PTI. The bodies have been sent for identification and they would be handed over to the relatives after autopsy. 3. Kerala bans trekking in forest: The Kerala government has issued directions that trekking to the hills should be stopped until all fire lines get cleared, said Kerala Principal Chief Conservator P K Kesavan. Authorities on Sunday rushed a police team to help in rescue operations of over a dozen students caught up in a fire in Theni forest area in Tamil Nadu bordering Idukki district, Kerala Police chief Loknath Behra said. Behra said instructions have been issued to Idukki district police chief to give all assistance in the rescue operation. “Medicines and food also have been sent to the spot. Behra spoke to his Tamil Nadu counterpart and assured of all help. He also asked Kerala State Fire and Rescue chief for all possible assistance,” a media statement from Behra’s office late Sunday night said. Theni borders the famed Thekkady tourist destination in Kerala.